Courtesy of media promotion site Eyes on Canada, we’ve got our first look at D.N. Ace, the upcoming Nelvana, Wexworks Media and OLM animated series headed to Teletoon. Glancing at the image, it shouldn’t be a surprise to find out the show will be animated domestically utilizing Toon Boom. The listing also reveals some of the show’s Toronto voice cast, which includes Lyon Smith, Samantha Weinstein and Juan Chioran. D.N. Ace combines the perfect formula of science fiction, science fact, and loads of awesome. The series follows curious, adventure-loving, mischief-making, proudly nerdy, 12-year-old Ace Ripley who suddenly learns he holds an incredible ability to manipulate DNA by fusing the genes of a living thing with any other thing, to create something entirely new. The hero-in-the-making uses his newfound power to create ridiculous, amazing, and even terrifying mash-ed up creatures, and tries to save his town from total chaos while trying to have the time of his life. The original announcement stated that D.N. Ace will have 80 eleven-minute episodes, that’ll also be available as 40 twenty-two minute episodes. 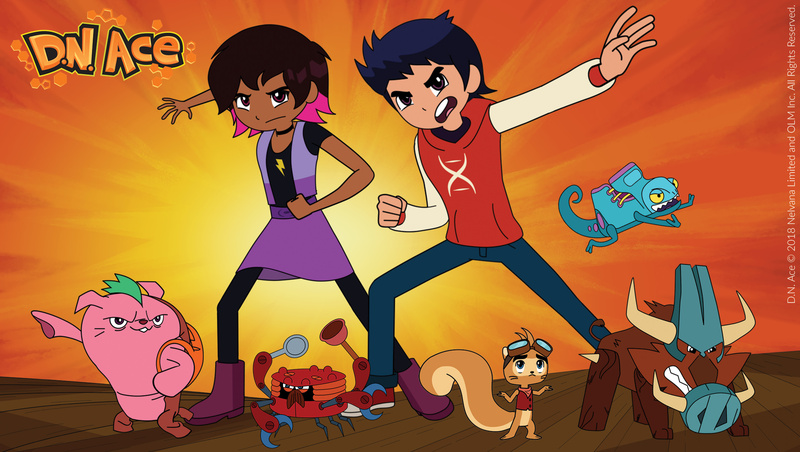 The series, aimed at kids 6-9, was created by Matthew Wexler, who serves as the show’s executive producer with his Toronto-based company Wexworks Media. Wexler previously worked at Spin Master on projects like Bakugan, Tenkai Knights and PAW Patrol. Nelvana has appointed Dentsu and OLM as the show’s Japanese representation. Both are also listed as consultants on the series, though OLM’s credit in the copyright line in the above promo image may suggest greater involvement. Notably, OLM is one of the first major Japanese animation studios utilizing Toon Boom software. The company first started experimenting with the Montreal-developed animation tool set in 2015 and has gradually been using more in Pokémon projects. Corus Entertainment, the parent company of both Nelvana and Teletoon, acquired Toon Boom in 2012.